It is that time of the year when some fellow Bengalureans will together paint the town red. Or yellow, purple, orange, pink, violet; name it and you’ll see the colour. Those Bengalureans are our beloved trees, getting into bloom, making namma Bengaluru look vibrant and pretty. It was a nippy and chirpy Saturday morning, with the White-cheeked Barbets calling tirelessly. Being a ‘true South Indian’, I had to complete my ritual of one cup of strong filter coffee, even at the risk of getting late. I still managed to reach in time for Neralu’s opening activity, Katte Parichaya by Kiran Keswani and team at Doddamavalli Katte. If you thought this city doesn’t wake up early on weekends, you should have been there to see the crowd gathered in front of the Ashwath Katte, intently listening. Kiran and team spoke about Katte and the trees (that sounds a bit like ‘Swami and friends’, doesn’t it? ), sharing interesting stories and facts, such as the Hindu divine trinity, paganism, the innumerable uses of the Peepal tree, community space, and even the ‘marriage’ between Peepal and Neem! Tree lovers gushed with pride, pointing to the crowd to crane their necks and have a look at the Mahua tree standing tall next to the Bisilu Maramma shrine. I smiled at the canopy, at the green leaves fluttering against the pleasant blue background. Business was as usual at the santhe, but this time, with a difference, because the vendors and customers had lent one of their ears to Neralu. The Parichaya was an interactive session, with many experiences exchanged, from Kattes in different parts of the country and ‘somari (lazy) Kattes’ to college Kattes. It took me back to my school days, when we, siblings, had to gather the fallen twigs of the Arali mara (Peepal) once a year, for one of the rituals at home. For the twig-gathering, we would visit three Kattes nearby, the ones near Dodda Ganesha temple, Bull Temple and Mallikarjuna Swamy temple. The Neralu team had made these colourful Katte postcards to be posted to friends and family, inviting them to Neralu. What a lovely concept! Kids rushed to write on their cards and post them in the cute little Neralu letter box. This old lady, frail and beautiful, picked up a card and examined it for a long while. Could she send it to someone? Did she keep it for herself? I’ll probably never know, but I’ll cherish the memory; that she had a Neralu card with her. I grabbed a quick breakfast and headed out to National Gallery of Modern Art (NGMA). It was so open, so inviting, and so green. It was indeed festival time! There were maps to guide us to different ‘in-tree-esting’ activities, and friendly volunteers were running around, just like busy ants on trees. I even got my wrist stamped with Neralu. My next morning was again a Neralu morning at MN Krishna Rao Park. The Kaleido group ran around the park, announcing “Banniri banniri, natakava nODiri”, inviting everyone to watch their play. The artists clad in red and black entertained the crowd, with witty dialogues and thought-provoking concepts. We didn’t need a laughter club that day to laugh out loud! I felt my eyes going moist when the artist said he moved out of Bendaluru to Neraluru. With my garden city boiling and baking, the name Bendaluru hurt. The crowd split into two groups for the tree walks. I joined the one led by Narayan. He made it very interesting, sharing stories from his grandparents, and asking us to name the trees based on what we felt, telling us how to differentiate between the Teak and Kanaka Champa. He took us to the Mast tree and asked, “Which tree is this?” Pat came the answer, “Asoka”. He asked, “Do you think Sita would’ve had any shade under this tree?” Now, that question made sure that nobody from his audience will ever mistake the Mast tree for the Asoka! I had to excuse myself at this point, for I had to run to one of my favourite Neralu activities – Yoga under trees. The instructor, Namrata Sudhindra, was brilliant. She taught us asana after asana, without a break, and I didn’t realize how time flew. It was peaceful under the shade of the trees, and as she promised, I can still feel the energy flowing through me. Unless we know about trees, we will never learn to respect or treasure them. We need to celebrate trees and our natural heritage. Neralu is becoming addictive, a habba that we all look forward to. This is the second year in succession that Bengaluru is celebrating trees. Here’s kudos to the team bringing this festival to us. Do catch the rest of the Neralu activities on February 14th. Summer time: get, set, activity! With every school, playschool and activity centre announcing a camp, which one do you choose? Citizen Matters lists out some. 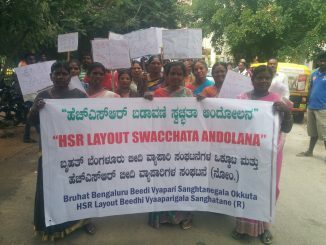 Street vendors of HSR Layout participated in a rally to raise awareness about waste management and vowed that they would do their part to dispose of their waste responsibly. 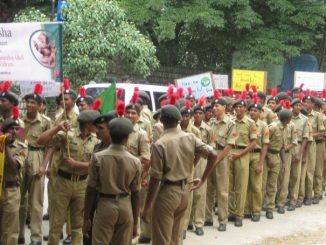 Students of MES college took out a march to create awareness on celebrating Ganesha festival the eco-friendly way. Many youngsters are jumping in to make the festival pollution free. I have missed a huge lot, as a tree-lover myself (I loved trees before I started birding! )…thank you for letting me share in these moments. Hope to be an active part of Neralu next year!